"This is my version of Turkish kebabs which I made 'off the cuff' after searching unsuccessfully for a recipe online. The original sandwiches are made from meat that is pressed into a loaf and grilled on a rotating spit. The meat is shaved off as it gets crispy and then put into a pita sandwich. My recipe calls for thin slices of meat to be marinated and then broiled to get the same effect without a huge rotating grill. Serve in a warmed pita with goat cheese, tzatziki sauce, lettuce, tomatoes, onions, and pepperoncinis." Place the chopped onions in a large ceramic bowl and crush with the bottom of a glass until juice is rendered and onions look translucent. Stir in 2 crushed garlic cloves, 1/2 cup olive oil, 2 tablespoons lemon juice, oregano, 1 teaspoon black pepper, turmeric, curry powder, and 1 teaspoon salt. Mix well; add the sliced beef and toss to coat. Cover the bowl with plastic wrap, and marinate in the refrigerator overnight. Combine the sour cream, 2 tablespoons olive oil, 1 tablespoon lemon juice, 1/2 teaspoon salt, 1/2 teaspoon black pepper, dill, and 1 crushed clove of garlic. Mix well; cover the bowl with plastic wrap and refrigerate overnight. Remove the meat from the marinade mixture, brushing off extra onions. Spread the slices on a baking sheet without overlapping, and salt to taste. Broil about 3 minutes per side or until browned and crispy, turning halfway through cooking. 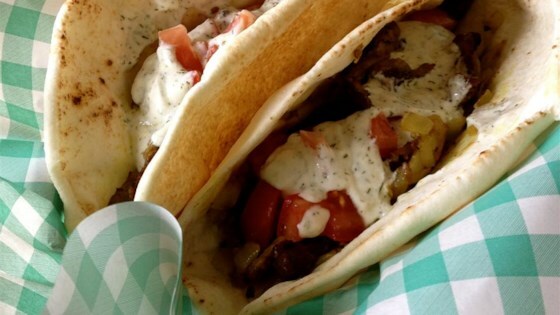 Divide the cooked meat between the pita breads, and drizzle with tzatziki sauce to serve. Spicy, yogurt marinated grilled chicken kebabs. You can use chicken instead of beef, too. Was good. Served it with a shredded zuchini pancake and nut-free bakalava for dessert! Went over very well. So, so good. Took me right back to Europe! The only changes I made were to use Greek Yogurt instead of sour cream, and I added a garnish of diced tomato, red onion, and cucumber. I made my own sauces, but the meat marinade was really good!